It’s not homemade, but it ain’t bad either. And unfortunately, it’s better than some we’ve had in restaurants. In the box is a plastic cooking tray of sliced eggplant covered with a mildly tasty tomato sauce and a good amount of mozzarella and romano cheeses. The plastic cooking tray serves double duty for heating either in the oven or the microwave (used for this review). The eggplant is sliced in circles (as opposed to slicing the eggplant the long way). The heated eggplant is not overly mushy, and not bitter as some eggplant can be. The main problem is that the eggplant are not layered very well in the tray. Some slices will overlay others and where the overlay occurs there is an absence of sauce and cheese. This is easily corrected by spooning some of the extra sauce and cheese in the box over the bare places. While the presentation may leave something to be desired, the overall eating experience is fine. For something that is mass-produced, this is surprisingly good. For me, the best parts are the sort of burnt pieces of sauce and cheese that form in the corners of the tray. If you have pets in the house, you’re going to need to fight them to lick the tray. This is a big box of eggplant – 1 pound 14 ounces big (851g sounds even bigger). 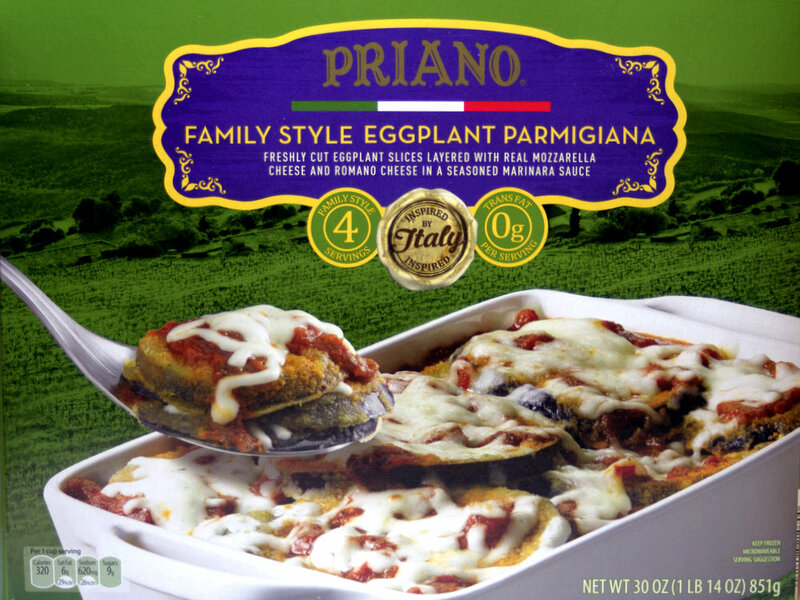 Make sure you really like eggplant or have an even bigger family than the box. There are four servings claimed per box. As a main course that might be stretching things. As a side dish, you’ll be able to eke out an extra 1 or 2 more servings. This entry was posted on 03/31/2016 at 02:15 and is filed under ALDI, Recipes, food, cooking and related items. You can follow any responses to this entry through the RSS 2.0 feed. You can leave a response, or trackback from your own site. This was fantastic. I felt like I had gone to a good restaurant. Thanks for adding your thoughts. Glad you liked it! Sorry you had a bad experience. Here’s the ALDI customer contact URL, if you’d like to write them directly. Thanks for adding your comment. Sorry you had a bad experience. 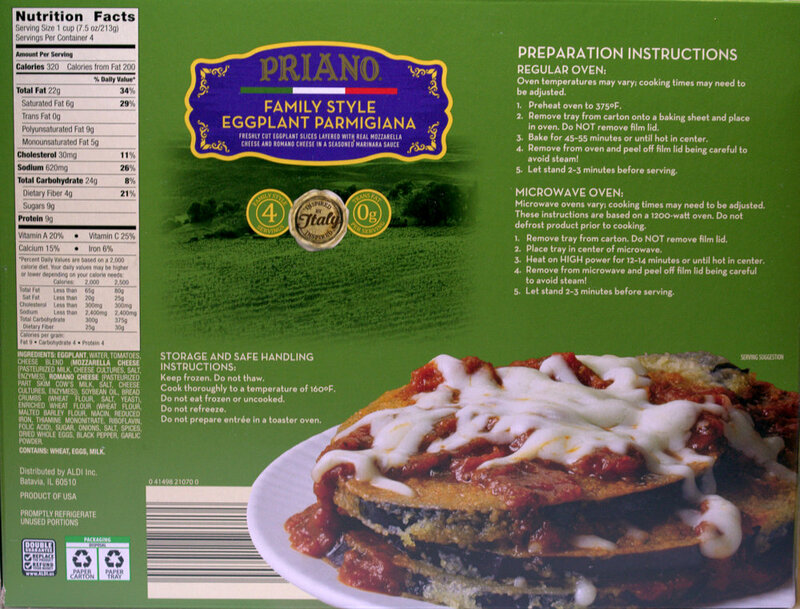 Eggplant Parmigiana is my favorite. Wonder if I can find this anywhere around here! If there’s an ALDI nearby, there’s a chance. But they don’t have it all the time. ALDI is a strange store. Good luck. What’s that saying about real men don’t need tripods? The camera was on the hood of my car (engine off). The reflection came off the hood. In fact, in the very foreground, that’s the color of the car. I just discovered this and I LOVE it!It’s better than I can get at ANY Italian restaurant in the area.I tried this last week and drove back to grab as many as I could get..only 4 left at the store! Great! ALDI needs a way to send an email reminder when things like this are available in the future. I know I’ve missed some of my favorites, like the liqueur cakes, that are only available a couple of times a year. I’ve also seen these in smaller individual sized boxes.